I use the Bible to study the Bible. To me, studying the Word of God is the best way to write about it. I don’t read much about what other people have to say about scripture. I prefer to experience it firsthand, not through an intermediary. This makes complete sense—to me. But it confused my friend when I tried to explain it to her. She gave me a quizzical look, as if I was speaking a different language. Yet I couldn’t figure out a way to clarify my view. Our differing perspectives may come from the training we received and how we view our faith journey. I have come to understand that through the Holy Spirit I can study the Bible: I can examine its words, grow in my faith, and better comprehend God. I don’t need a human middleman to explain it to me. I embrace the Holy Spirit as my spiritual guide who provides the insight I need. However, other people are taught and come to believe that they are unable—or unworthy—to study the Bible on their own and get truth from it. They need someone to guide them. They need an expert, a guru. They need a preacher, one who went to seminary and has been ordained; someone who knows Greek and Hebrew, the Bible’s original languages. These folks have been conditioned to believe they need someone to tell them what the Bible says, what it means, and how to apply it to their daily lives. God created us with a mind to think for ourselves and gave us the Holy Spirit to guide us. He placed within us a desire to draw close to him. We don’t need someone to facilitate this process. Through Jesus we have all we need. Therefore we no longer a middleman to connect us with God, like they did in the Old Testament or what many church goers seek today. There’s no point in having someone tell us what the Bible says—unless we’re unable, unwilling, or too lazy to do it ourselves. God has given us all we need to discover biblical truth for ourselves. Thank you Father, Son, and Holy Spirit. I really agree with your point here, and never really thought about it until you brought it up. Thank you. 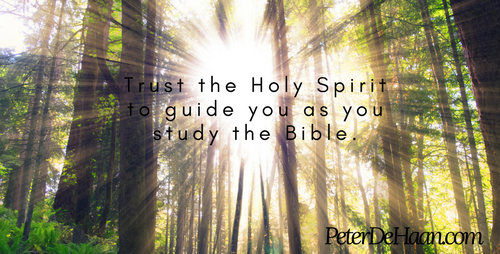 I will certainly feel more confident in reading and studying on my own with the Holy Spirit. We don’t need to be educated to have the Holy Spirit guide us, we just need to listen. I had received the gift of the HOly Spirit and with evident of speaking in tongues. Well in 1998, I had to pray for a group of people but I had never prayed for a group. I can recall reading a book by Benny Hinn “Good Morning Holy Spirit “. In that book he said if you don’t know how to pray then ask the Holy Spirit to teach you how? I did. At the meeting, I Beginning praying,, “Let the words of my mouth, and the meditation of my heart, be acceptable in your sight, O LORD, my strength, and my redeemer. Psalm 19:14. Yes the Holy Spirit is our Teacher, helper etc. Yes, Margaret, the Holy Spirit is amazing. All we need to do is ask!